OSWEGO, NY – Oswego Rotary recently hosted Jordan Karp from the Adirondack Distilling Company. 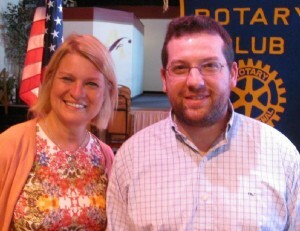 Pictured are Oswego Rotary President Melanie Trexler and Jordan Karp. Karp is one of the original founding members of the distillery. Doors opened in the fall of 2012 with a mission to produce New York’s finest handcrafted spirits. Locally grown New York corn is distilled in a custom made copper still to produce gluten-free ADK Vodka, ADK Gin, 1,000 Stills White Whiskey and 601 Bourbon. In addition to Karp, a doctor and lawyer shared a vision, one of bringing hand-crafted spirits to Central New York. Spirits created with the finest locally grown ingredients and using an environmentally friendly distilling process. Based in Utica, in 2012 their vision became a reality.